Both mics prove excellent for vocals while the Gemini 5's unique design offers flexibility. Quality sound. Two separate and different-sounding signals from a single mic (Gemini 5). Comes with durable carrying case and suspension mount. Even with its valve and FET options the Gemini 5 still doesn't offer as much variation as two different mics will. 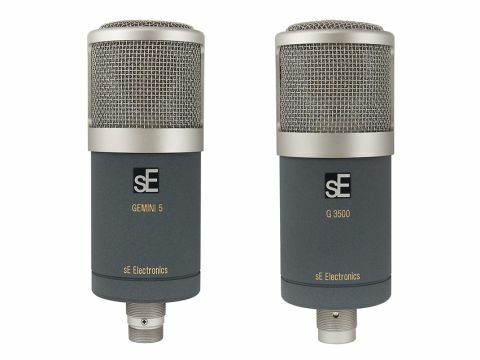 sE Electronics' original Gemini mic and its Gemini II successor were named as such because the design sports twin valves, something quite unique - the only mics, in fact, to feature two valves in the circuitry - the extra valve in place of the more traditional transformer. The latest Gemini mic is also quite unique and still lives up to its 'twin' name. Not, this time, due to two valves but to twin signal paths - albeit not identical twins. "Looking at it another way, you are paying for a valve mic and getting a FET mic for free." The Gemini 5 is the first of its kind - it's a microphone with two outputs, one routed via valve circuitry and the other via circuitry featuring an FET, allowing the option of using both sounds separately or blended. So how did such a radical idea come about? The story begins at a sE Electronics development meeting where the company were thinking about new products to introduce. The Gemini design had proved popular with, not only a unique two-valve configuration, but also a capsule unique to itself, and the idea of building a solid state version utilising FET circuitry rather than valves in conjunction with the Gemini capsule took shape. That mic is the G3500, with exactly the same look as the Gemini but, without the need to house a couple of valves, reduced to a more compact 70% of its size. With the knowledge that the capsule would work well with both valve and FET circuitry, came the unique idea to incorporate both types into the same mic, the result being the Gemini 5 - effectively an FET and a valve mic in the same enclosure. What you get with the Gemini 5 is a mic that looks just like a valve mic with its 8-pin cable connecting to a brushed aluminium power supply box. Look closer at the box, however, and you'll see that there are two XLR outputs - one for the valve signal path, the other for the FET signal path. Both the G3500 and the Gemini 5 are built to the usual sE Electronics high standard of construction and both come in solidly-built flight cases and with a rugged suspension cradle. There are no extra switching facilities on either mic - no pad, or no high-pass filter - and both offer just a cardioid pattern. Visually, the only difference is that the Gemini 5 has a series of openings on its body, presumably to let the heat from the valve escape. We first put the G3500 to use on a session recording acoustic guitar overdubs and the sound was pristine, capturing all the body of the guitar and the crisp top end detail - there's a very nice airy top end to the mic that was also apparent when recording a vocal. Side-by-side, the G3500 and the FET side of the Gemini 5 sounded very similar as might be expected. We then checked out the dual aspect of the Gemini 5 by recording both FET and valve outputs simultaneously through identical mic pres and A/Bing the recorded results. Excellent results were obtained on vocals, acoustic guitar and a variety of hand-held percussion from both of the mic's signal paths with differences between the two sounds being subtle but clearly discernible. The valve side exhibited a little more in the bottom end and had a slightly more subdued top than the FET. In practical terms, subjectively, we preferred the sound of an acoustic guitar recorded through the FET path and thought that a male vocal recorded via the valve had more of what we were looking for on that particular track. Yet the great advantage with the Gemini 5 is that in a recording environment, we could record both and choose which to use in the mix later - or both for a combined sound, if that's what we wanted. First off, the G3500 is a mic that we'd have no reason not to recommend for producers and musicians who want at least one quality condenser mic, primarily for vocals but capable of plenty of other tasks. However, if there is the extra money to spend, the Gemini 5 is everything that the G3500 is, with the added quality and versatility of the valve output. Looking at it another way, you are paying for a valve mic and getting a FET mic for free. That being said, neither mic is a budget option but, bearing in mind that, until the end of the year, Sonic Distribution are also throwing in a free Dual Pro pop shield worth £99 plus a free Project Studio Reflexion Filter worth £109, they do offer good value for money as a full recording solution. The first priority for the majority of home and project studio owners when buying a microphone is to source a decent solution for vocals, usually a large diaphragm condenser. However, most would really like to have more than one mic, if not a whole collection. The Gemini 5 addresses that situation directly, as it can effectively become two mics in one. Now, while it's true to say that the signal paths are not as radically different as say, two separate mics with different capsules would be, they are still different and that difference provides some very valid alternative options for making quality recordings. Hard to fault its sound and full marks for versatility.